A talented little boy is devastated after leaving his valuable violin on a bus. 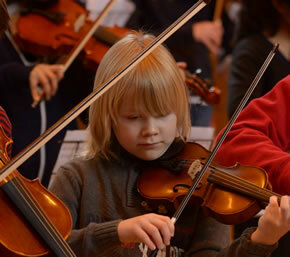 Ten year old Ignacy Stefanowicz (pictured, with a different violin) lost the valuable instrument on Saturday, 1 February while returning from a music lesson with his mother and baby sister. The young musician and his family are hoping a £200 reward will help reunite him with his missing violin. Ignacy had the violin when he boarded the 235 bus from Busch Corner shortly after his lesson ended at 11.15am. The family got off the bus at Bell Corner, Hounslow, took the 116 to Bedfont Green, and arrived home, which was when he realised he had left his violin behind. Ignacy is one of only 7 local pupils who receive the Mayor of London’s Scholarship for talented musicians, and had been lent this violin by an instrument trust. He is devastated to have lost the violin as not only was he a very talented violinist, but his grandfather, who recently passed away, made violins. The violin is in a blue case with a distinctive handmade green pocket with a floral pattern on the top. The violin is pale straw colour and has a label stating it was made by Peter Sermon in the 1920s. The police have been informed as have the bus companies, but so far there is no sign of the instrument. If you have any information about the violin please call Hounslow Music Service on 020 8583 2967, email info@hounslowmusic.org.uk, or contact Hounslow Police station. A reward of £200 will be made to the person who finds and returns Ignacy’s violin. If you can help in any other way please contact Hounslow Council.